The iPhone 4S is already fast but as you know, it is not 4G compatible. 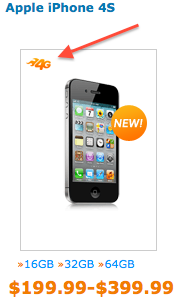 Well, AT&T currently advertises 4G for the iPhone 4S on their website. This is most likely a mistake on AT&T’s behalf because if this were true, we probably would of heard of it before today. I just talked to AT&T and they do indeed consider the iPhone 4S as a 4G device because of HSPA+. The AT&T rep I talked to agreed that it wasn’t a very fair denomination and said it was more 3.5G than actual 4G.